From all the dried legumes, fassolia (beans) are my favourite. 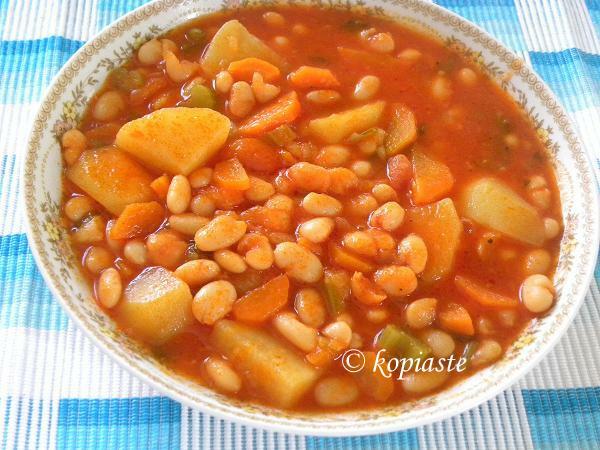 Fassolada (or fassoulada, as the peasants call it), is a hearty navy beans stew, or soup if you like and is considered to be the national food of the Greeks. In this stew (or soup) a few vegetables, such as carrots, potato, onion, garlic and celery are added and cooked in a simple tomato sauce. Greek food is simple with a few spices but full of flavour which comes from the amazing Greek olive oil, used in all Greek dishes. According to the principles of the Mediterranean Diet, we should eat dried legumes at least three times a week in order to benefit from its health effects. Soak the beans in water from the previous night. Drain the water and place the beans in a pot with fresh water. Boil for a while and remove any froth which arises. Drain once again. In a pot heat the olive oil and sauté the onion and garlic until translucent. Add the potatoes, carrots, celery, spices and mix. Add the tomato, blended with the tomato paste and the vegetable bouillon dissolved in hot water. Add more water if needed to cover it and make it soupy. At this point you can either continue cooking it on the stove top or transfer it to a “gastra” (similar to Dutch oven) and continue baking it in the oven. Bake for two hours in a preheated oven to 200oC (400oF). After half an hour, stir the stew and discard the bay leafs, cover again with the lid and continue cooking until done. If you wish to continue cooking it on the stove top, bring to a boil, lower heat and simmer until soft, for about an hour and a half, mixing regularly. Add more water if necessary. After about an hour, remove lid and cook uncovered until the sauce thickens, stirring regularly. I have just found your blog and am thrilled as I adore Greek food! I have yet to visit to country but for now I can enjoy your blog!! Hi and thank you for your comment. Hope that you will be able to visit Greece soon and enjoy the nice food and beautiful places. Um-um good! Nothing better than fasolada on these cold days. Absolutely, although today is a wonderful shiny day, but it’s Friday and I’ll try as well to post vegetarian on Fridays.